For those of you not from the South, Mardi Gras is more than a day of overindulgent binge drinking; it’s a institution that is celebrated with the same “awe” and “tradition” as Christmas or Thanksgiving. The closer you get to the Gulf Coast, the more opulent and extravagant these celebrations become. While the celebration of Mardi Gras was originally observed by Catholics to mark the beginning of Lent, is has become a mainstay of Southern culture for Catholics and Protestants alike. 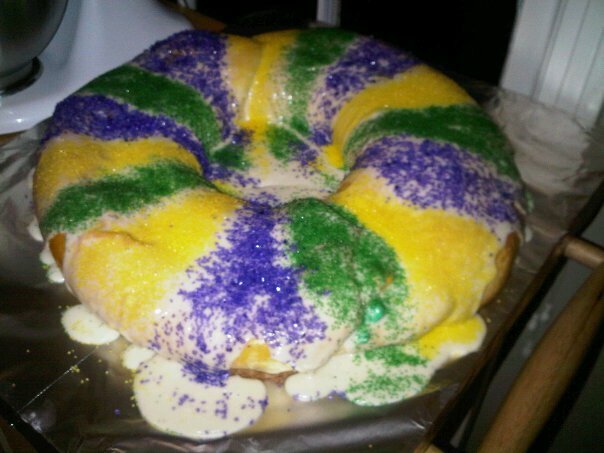 Unfortunately, the post-Katrina diaspora of Mardi Gras traditions did not include one of its most enduring symbols, the King Cake. Traditionally, this cake is served to party goers after the main feast, and is supposed to represent the “King’s” crown worn by the Biblical wise men. But even further to the south, our neighbors in Latin America enthusiastically observe similar traditions to mark the beginning of the Lenten season. These traditions hold the same esteem as those in the southern U.S., and one of the most striking similarities is inclusion of the King Cake, or Rosca de Reyes. So when a friend of mine from the local university’s Latin American society called me to complain about the dearth of suitable substitute cakes for his celebration, I fully understood his dilemma. It seems that if a good King Cake is hard to locate in north Alabama, an edible Rosca de Reyes is damn near impossible to find. I couldn’t resist the opportunity to lend a helping hand to the students from my collegiate Alma Mater. 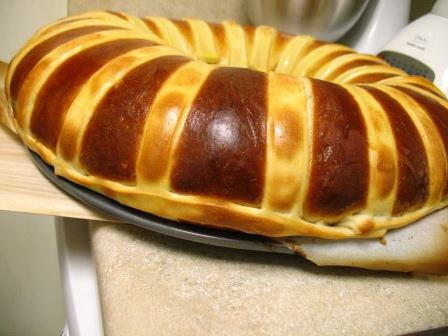 The result was an amalgamation of the two traditions; the flavors of a traditional Rosca de Reyes prepared in the style of an American King Cake. Though I am obliged to point out the inclusion of beer would probably make strict observers balk at the idea of calling this a King Cake, but c’est la vie. In a large bowl, combine the flour with the beer and yeast mixture; lightly with your hands. Add the eggs and continue mixing until everything is well incorporated and well mixed. Add the milk mixture, almond extract, and whiskey to the flour mass and knead until the dough is springy, smooth, and elastic. If the dough is “crumbly,” add water a tablespoon at a time. If the dough is sticky and won’t form a ball, add some flour. Don’t worry about these additions; the final product is a result of the natural gluten proteins found in the flour. This variable can fluctuate from brand to brand (I always King Arthur brand for my breads). Grease a non-reactive (glass or ceramic) bowl with non-stick cooking spray, and place the dough ball inside. Heat the oven to 400 degrees for 2 minutes; no more, no less. Place the dough into the oven, and allow it rise until it has doubled in bulk (approximately 90 minutes). When the dough has risen divide it in half. On a lightly floured bread board (not a cutting board used for things like meat, onions, or garlic) or your kitchen counter, roll out the dough halves until they make two rectangles, approximately 20 x 14 inches. While the dough it rising, place the chopped, dried fruit in a small pan on the stove with the rum, heat on high for 10 minutes. Allow the mixture to cool to room temperature. Drain off the remaining rum. Combine the flour, water, and sugar; knead until smooth and allow to rest while the dough finishes rising. Roll into a rough rectangle approximately 1/8 inch thick. Cut into 1/2 x 5 inch strips. Set the strips aside until final assembly. Once the dough body has doubled, been halved, and rolled into two rectangles, spread half of the cream cheese mixture onto each rectangles (make sure to leave approximately 1 inch borders on the rectangles. Evenly spread 1/2 of the fruit mixture on top of the cream cheese. Sprinkle 2 teaspoons of cinnamon on top of the fruit and cream cheese. Tightly roll each rectangle lengthwise, making sure to keep the filling in this tight roll. Pinch the long seem of the coil onto itself to make a solid, leak proof rope. On a round baking or pizza pan (the total diameter needs to be greater than 12 inches) lined with parchment paper, form the rope into a semi-circle. Form the second rope of dough into an opposing semi-circle on the round pan. Pinch the two ends together to form a single, large circle. Liberally brush the dough circle with cold water. Place the strips of dead dough on top of the dough circle. Tuck the edges of the strips under the dough body. At this point the entire creation should resemble a “banded rope of dough formed into a circle.” Brush the entire circle lightly with cold water. 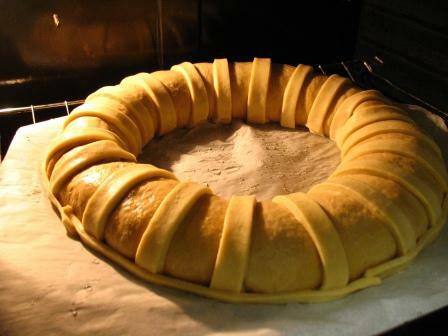 Place the dough ring into the oven and allow it to rise again. Approximately 30-60 minutes. Remove the ring from the oven. Once the oven has reached the requisite temperature, place the pan of boiling water on the bottom of oven. Place the risen dough ring above the pan of boiling water. Bake for 10 minutes, turning once. After 10 minutes, remove the dough ring from the oven and turn off the oven (close the door as quickly as possible). Working as quickly as possible, brush the dough ring with the egg-wash and return it to the oven. Turn the oven on to 375 degrees. Bake for an additional 18 minutes, turning once half way through. The dough ring should have a “hollow sound” when tapped lightly with your fingernail. Carefully remove the ring from the pan, and allow it to rest until it has completely cooled. When the ring has cooled, pour the glaze (made by rapidly mixing the powdered sugar, vanilla extract, and milk) onto the ring. Decorate as you desire, being as creative as you see fit! The glaze and decorations are beautiful, but it does seem almost a shame to cover up such a beautifully browned cake! C'est magnifique!